What Is Top Dressing ? It’s the same method that is used on Golf Course putting greens to produce a smooth carpet like turf. Sand is the primary material used for Top Dressing. Top Dressing introduces new soil to existing turf, which will level the surface and promote the decomposing of thatch. The Upstate has a clay based soil by applying sand to the soil it improves the color and promotes growth for Bermuda / Zoysia / Centipede / Fescue turf grasses. Top Dressing with sand will improve Drainage, softens lawn surface & stimulates Growth in areas of underdeveloped turf. For Smoothing lines, gaps & patches in newly laid sod. The challenge we have in the upstate is our red clay soil, which becomes compacted, impenetrable and sheds water and nutrients. Raising your water bill and smothering out the health of your lawn. 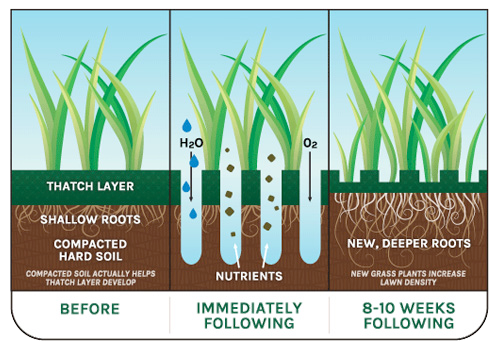 Deep Plug Aeration is all about developing the health of the root zone. The aerator prunes the sprigs at the root and leaf level. This opens the root area which will allow penetration of fertilization, oxygen and water. This will improve the root depth and growth which benefits the nutrient uptake by the turf grass. Top Dressing with sand after aerating promotes vigorous root growth for a healthy turf. We have been in the upstate of South Carolina, Top Dressing and Aerating since 1998. ProTurf specializes in leveling lawns, transforming sports fields and maintaining putting greens. Our outlook is simple: We treat your lawn as if it was our own.